Posted on January 15, 2018 , in Hot Tubs. When shopping for a hot tub, you should consider your lifestyle and how a hot tub will fit into your life. Luckily, there are tons of different features and models which can meet practically anyone’s needs. Not all hot tubs are created equal, so the quality, benefits, and features can vary significantly between manufacturers. It’s also important to know which features you can typically customize on a hot tub to enhance your experience. In this article, we’ve outlined the key areas of a hot tub you should consider to make the best choice for you and your family. Before you purchase a hot tub, you want to know how much time you’ll spend cleaning and maintaining it. There’s a wide range of hands-on work across the models available on today’s market. For those who want to spend more time hot tubbing and less time cleaning, there are models which have a self-clean mode. Hydropool is one such hot tub brand that vacuums, skims debris, and filters the water for you in 15 minutes. A hot tub is a big investment, and you want it to last for as long as possible. That’s why investing in a quality tub will serve you well. You can tell a hot tub is of high quality if it has ergonomic seating, high energy efficiency, thick insulation, eco modes, and customizable massage features. You can also tell if a tub is high quality based on the manufacturer’s warranty. If it’s a long-term and comprehensive warranty, that signals that the manufacturer stands by its hot tubs. Reading online reviews can also help you gauge quality. Massage jets are one of the top reasons people get a hot tub in the first place. 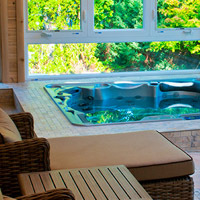 Each hot tub comes equipped with different massage jet placement, pressures, and programs. Look for models that have customizable massage settings and therapeutic wellness programs that target specific areas of your body. Hot tub designs vary widely from manufacturer to manufacturer. Some have multi-level seating while others have ergonomic seating. It’s important to consider who will be using your hot tub, their size, and their shape. Before making a purchase, ask your hot tub dealer to do a wet test which is where you sit in a filled-up hot tub model to test how the seats and jets feel. Now you know all the parts of a hot tub you should consider as you shop around. To start browsing available models, download our buyer’s guide.